* from the book blurb: ADVENTURES IN MOTHER-SITTING is a memoir that speaks to a journey through grief, through losses of many kinds. I read this book with the intention of reviewing it, especially since I also am a caregiver of a loved one. 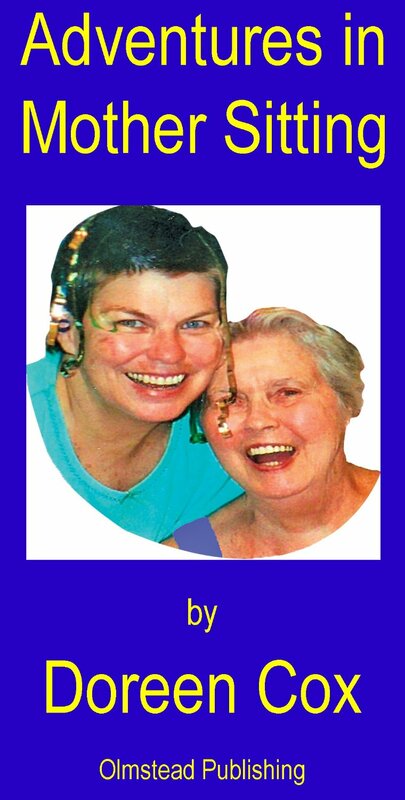 Adventures in Mother Sitting is a book written by the daughter of a woman with Alzheimer’s disease. Doreen Cox wrote from raw and real emotions and experiences. She took the reader through her journey, preserved in journals, in a way that draws the reader into her life, and into her home which she shared with her mother for whom she became a “care bear”. Three things that stood out to me in a less positive way are: 1. I have never read anything where the author used quotation marks as freely as in this book. 2. It felt as if chapters 11 and 12 yanked me right out of the story and were not necessary. 3. Some repetition seemed unneeded as the reader can understand what was said and will likely remember most of it from before when encountering things that relate back. Now, that out of the way, the great things about this book are the honesty with which the author wrote and her willingness to share it all. She told in great detail, some parts difficult to read because of the exposed reality of the disease, about how Alzheimer’s (dementia) steals from its victim. Not only are memories stolen, but the memory of how to do even the simplest things disappears. The brain is confused and damaged by the disease, affected in such a way so as to make it stop relaying the usual messages we all take for granted, such as how to eat, dress, carry on a conversation. There is so much to learn about Alzheimer’s, so much to understand in caring for someone afflicted. Doreen opens a window into seeing what it is like living with that horrible disease, and how acutely needed are love, compassion, patience, understanding. She also bravely shared how it sometimes became too much for her when she was sleep deprived and exhausted, and how she coped – or failed to cope – with the demands on her. Adventures in Mother Sitting is told with humour, love, and tenderness, but also with a sometimes shocking truth. It is raw, revealing, and perhaps awkward for some people to read, but it should be read anyway. Two years ago I wrote a review of Still Alice – a fiction novel about a woman who learned she had Alzheimer’s, and covers two years of her life as the disease gradually takes over her brain’s ability to function. It is a book highly recommended among caregivers of Alzheimer’s patients, and during our Alzheimer Caregiver Support Group meeting this month I recommended Adventures in Mother Sitting by Doreen Cox. If you are facing dementia in any way, particularly as a caregiver of someone so afflicted, I suggest you read this book. It will help you to understand more from the viewpoint of the caregiver, enabling you to see from the author’s experience how the disease changes a person’s abilities and mind to that of total dependence. You can find Adventures in Mother Sitting listed on my BUY THE BOOK! page. This entry was posted in Mostly About Reading, Reviews & Interviews and tagged Adventures in Mother Sitting, Alzheimer's, Book review, caregiving, caring for a loved one, dementia, Doreen Cox, grief and loss, journey through grief, memoir. Bookmark the permalink. Thank you for sharing this powerful review. It’s good you actually pointed out the “less positive” aspects about the novel and then dove right into the great ones. Gives the reader a better understanding from all angles. My great grandmother suffered from Alzheimer’s and it was very hard for me to watch her pass on not remembering us. She was such a light in my life when I was growing up so when she could no longer recognize me… well, to say that was hard would be the very least. I’m glad you enjoyed the review, Gina. I certainly understand how you felt about your great-grandmother’s suffering. Alzheimer’s becomes everyone’s suffering. Over the past month my dad has failed noticeably more; it makes the caregiver feel quite helpless at times.